I'm running Linux kernel 4.17rc5. (this problem is also with the 4.16 kernel and 4.15). My computer randomly freezes up after a hour of less and sometimes it works for more then a day. But when I check the kern.log or syslog it does not show any messages at the time of crashing. So is there a way that I can find you why it crashes? Also, after a crash it sometimes refuses to boot at all. It will give me a black screen. After restarting for 20 or more times it boots up. Sometimes my password doesn't work while booting even though I use the same (correct) password after the restart. I'd like to include some logs but Can't find any relevant logs since it does not log during the period of the error. I Have attached a picture of my screen that it will sometimes show. After the reboot I used the kernel 4.17r5 again and it did work. This happens to me a lot and it can take a lot of restarting in order to boot. In the video it didnt show the problem that my password would not be recognised. However this sometimes happens too. One more bug I'm having is that my thrird screen is not being recognised to it sets a lower screen resolution. I have solved this with forcing the screen resolution to 1080x1920 but then the menu bar is not shown correctly. and I have to drag the screen to the right place in the settings in order to have the menu's correctly. Is there anything more I can do to make this bug report more specific? Did this issue start happening after an update/upgrade? 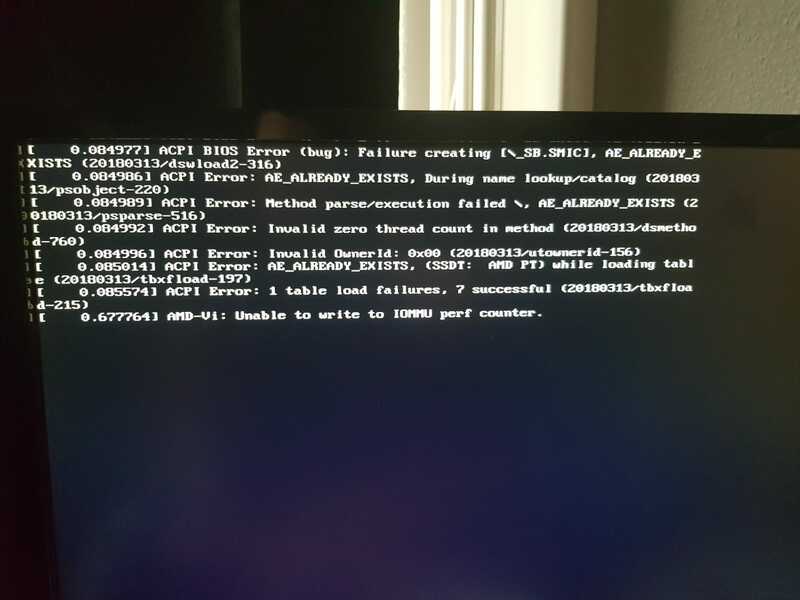 Was there a kernel version where you were not having this particular problem? This will help determine if the problem you are seeing is the result of a regression, and when this regression was introduced. If this is a regression, we can perform a kernel bisect to identify the commit that introduced the problem. Also, would it be possible for you to test some prior kernels to see if there was a previous good version? If there is a prior good kernel, we can perform a kernel bisect to identify the commit that introduced this bug. I would suggesting starting with 4.14, then maybe 4.13, 4.12, etc. I've tested it on version 4.14 and it seems to boot up every time. However It will only turn on 1 display instead of 3 and at a low resolution. I've repeated the test 5 times with the same results. after that I have tested 4.17 and it hung up again at boot. If there is a clear way somewhere that explains me how to do a git bisect, I'd love to help out and narrowing the bug down to the commit. Install the newly built kernel, then reboot with it. Repeat to "make -j`nproc` deb-pkg" until you find the commit that causes the regression. Makefile:928: "Cannot use CONFIG_STACK_VALIDATION=y, please install libelf-dev, libelf-devel or elfutils-libelf-devel"
Sorry for the late reply. Please install libssl-dev.